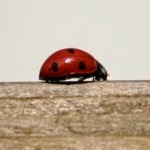 In my room I have hundreds of ladybirds clustered round the top of my window. At fist I was excited because ladybirds are cute. But pretty soon this excitement turned to terror as I found out they were evil ladybirds! The Harlequin ladybird retreats inside this time of year to get away from the cold. They are slightly bigger and more orange than the ladybirds we know and love. They have come over from south America and are eating their English cousins! How scary! The native ladybird is more hardy and can stand the outside cold. Good for them! 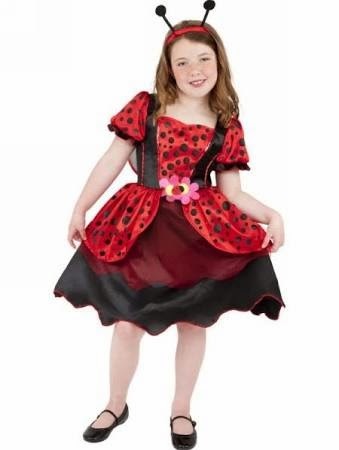 The lady bird costume we have here at Toyday is the good one....not the evil one... Because its red with black dots and for 4-6 year old, so its for little ones. Maybe if you wore it, the bad ones would think that you were a giant good ladybird and run away? But remember to watch out for your cousins!.... they could try to eat you. To end on a positive note: these new bad ladybirds don't like the smell of menthol, so if you keep you room minty fresh you should be fine.